Blue Spires is a is a versatile waterwise plant that is heat and dry tolerant, which will grow in full sun right through to full shade. It is easily grown and managed and combines happily with both native and exotic plantings. Blue Spires is a useful landscaping plant, and as ground cover under taller shrubs and trees will add interest to the garden, whether in sun or shade. It can be pruned to a neat shape at any time of the year. In courtyards and patios it can be planted in decorator pots, looking particularly striking in black, burgundy, red and blue pots. 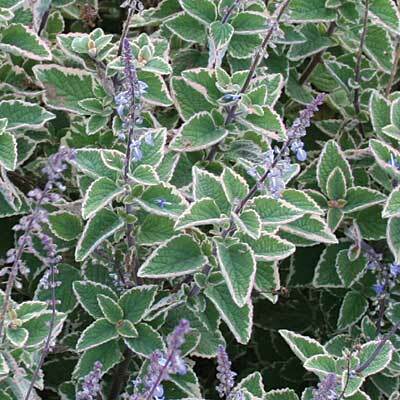 All Plectranthus are easy to grow and care for and Blue Spires is no different. With no noticeable pests and diseases it is a gardener's dream plant to grow. Prepare the garden bed by digging in humus material and mulch after planting. In decorator pots use a top quality potting media, water as needed making sure the root zone does not dry out. Pruning is best done in warmer months if needed. Once or twice a year apply a complete fertiliser as liquid or slow release. Plectranthus parviflorus is an east coast Australian native and Blue Spires was bred by a Queensland native plant enthusiast. It was selected for its variegated foliage and compact neat growth.Derived from the Australia native species Plectranthus parviflorus, Blue Spires has rounded felty green leaves with a creamy white edge and produces spires of pale blue to violet flowers from spring through autumn. It has a clumping habit growing to around 40cm high x 30cm wide.